There’s plenty of celebrities jumping into the Canadian cannabis market, many of them through the LP Canopy Growth Corp. such as Snoop Dog with his line Leafs by Snoop, also Martha Stewart. 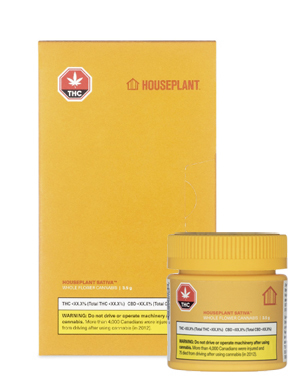 Now the LP has teamed up with Seth Rogen, our lovable Canadian born stoner with his line of cannabis called Houseplant. What can I say, I absolutely adore Houseplant for their retro packaging and marketing with a clever modern twist. Their tagline is something I 100% believe in and live by with Weed Mama “We have a sincere love for cannabis, and think it should be treated with the reverence it deserves.” However, is the strain good, will it be the same substandard flowers we currently have on the legal market? I’ve yet to buy it, so I can’t tell you, but if you have please leave a comment with your thoughts. The Houseplant line currently has a sativa, indica and hybrid strain however (as of writing this) only the sativa is available. The sativa strain is described on the B.C Cannabis online store as a high-THC strain (Chemdawg) from OG Kush and Sour Diesel lineage. They will also be adding prerolls and soft gels to their product line in the future.